I'm sure you've seen the old cloud-in-a-jar experiment before. In case you haven't, you just place some ice cubes in a metal pan. Place the pan on top of a jar, filled with an inch of warm water. Take the jar, and pan to a dark room, and shine a flashlight through it, to see the cloud forming, and swirling. It's a lot more spectacular than I thought it would be. I've seen the experiment on a number of blogs, but was moved to action, when we found it at the back of Josepha Sherman's Shapes in the Sky, A Book About Clouds. 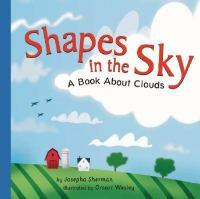 Sherman's book starts out as a dreamy sort of story, watching shapes drift by in the sky. But, it quickly changes to a factual science book for younger children, detailing cumulus, cumulonimbus (can you even read that, without hearing the voice of the Russel from Up!? ), stratus, and cirrus clouds, and their effects on the world. As well as providing the cloud experiment at the back of the book, there is also a glossary of terms, some fun "fast facts", and a number of additional Internet, and library resources about clouds. Linked with Feed Me Books Friday, at The Adventure of Motherhood. I have wanted to do this for a while. I'm going to look for that book and do this soon. Thanks! How fun! I am adding it to my reading list - thanks for heads up. And, no, I haven't seen and haven't done "a cloud in a jar" before. Wow! I'm glad you jumped to action and tried it. That is spectacular! We've had a lot of questions about clouds lately. I'll have to try this - and look up your book suggestion! We found a cute book called Clouds for Dinner - not scientific at all, but about appreciating the differences in families. Mom, Is That A Volcano?